St Michael's Church, Theydon Mount, Essex. The original church dated from the 13th century. In 1611 it was struck by lightning and burnt out. The present church was built during the period 1611 - 1614. In 1834 there was a "thorough restoration" during which a west gallery was built; it was specifically for the church band, the singers and the servants at Hill Hall, the residence of the Lord of the Manor. 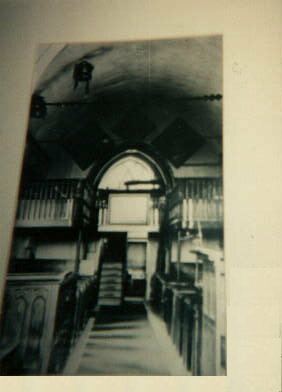 The above photograph is of the west gallery, taken from a framed photo hanging in the church. The gallery occluded the part of the west window, as a result of which the church was dark. It was taken down in 1926 when it was feared to be collapsing.